Ikigai (生き甲斐, pronounced ) (ee-kee-gah-ee). According to Japanese culture, we all have an ikigai, a ‘reason for being’ or a 'path to life fulfillment'. Japan is is known for the life practices that lead to longevity of its people, reaching an average life of 83.7 years. Previous studies have shown Japanese longevity to be closely related to dietary practices. New studies on Japanese philosophy have shown the life fulfillment through ikigai as a key component to longevity. Its seems like there is more to life than just food after all. Ikigai is made up of four different themes. Step by step your personal Ikigai will crystallize. This is not possible right away and under no circumstances under pressure. 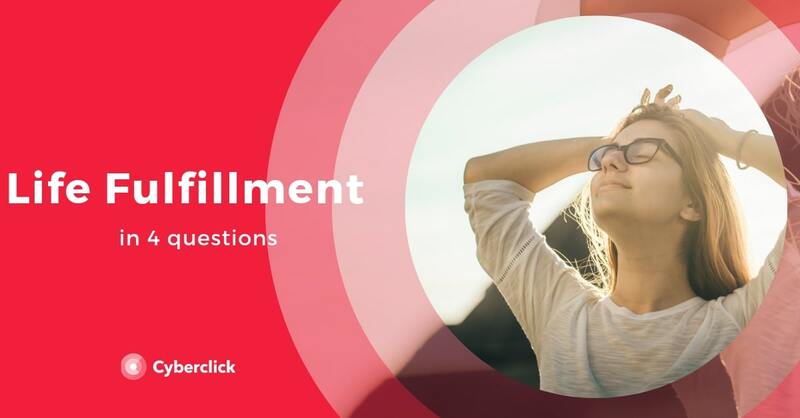 Nonetheless, with 4 questions you too, can start your journey to find out your personal Ikigai and begin your practice of the Japanese philosophy of life fulfilment. Defining ikigai as a practice. Ikigai isn’t just another guide on ‘how to be happy’. 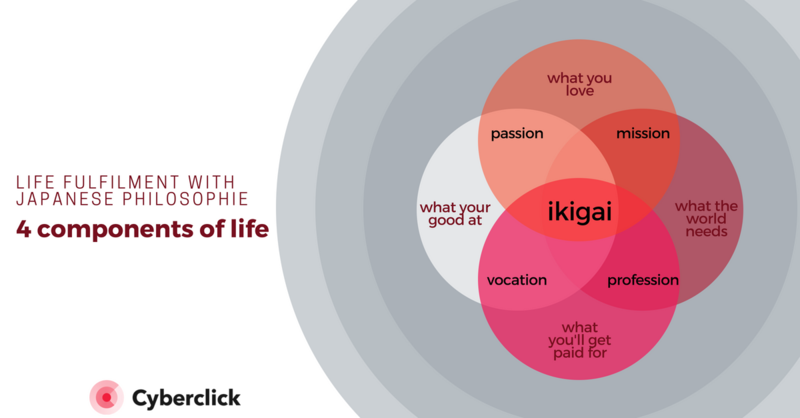 The ultimate goal of Ikigai is not happiness - it’s about a life practice towards fulfilment. If your looking for a quick fix for happiness, keep in mind that Japan is ranked merely 51 in the world's happiest countries (UN-sponsored World Happiness Report 2017), and so ikigai may not be the practice for you. Practicing your ikigai is defining your purpose, your personal mission and discovering your full potential. The aim is to define what you can best contribute to the world, the things you’re good at and that give you pleasure while doing. Those who are actively pursuing practices to discover their ikigai have shown more self-esteem, feeling their presence in the world is justified. Psychologists explain why identifying our purpose in life can help us in life satisfaction. They claim that if we are able to find our ikigai, everything will be easier and pleasurable. Easy, because we'll exercise our most tuned capabilities. Pleasurable, because it will seem worth doing. Where are people finding their Ikigai? There are people who feel that they can not find in their special abilities or goals to life fulfilment. Some are finding themselves living the reality of torturing themselves out of bed and dragging themselves laboriously to work. The feeling of drive and passion for work has become but a distant memory. People can often find it hard to find a spark for their occupation and the dream of finding their ikigai has not even had the chance to surface. Cyberclick's founder and CEO David Thomas explains where his passion towards motivating his team to find life fulfilment came from in a recent interview, "Years ago one of my closest friends went through a long period of time where every Sunday evening, like clockwork, he would feel a terrible dread for the upcoming workweek. He was spending so much of his life being unhappy at work and on top of that he wasted Sunday evenings dreading the week to come. After witnessing this pattern that developed I started to ponder what made him feel this way and how companies could avoid the Sunday evening dread." At the work place, one of the main findings of motivational research is that extrinsic motivation is unachievable, in other words, it is impossible to motivate other people. At least not to things they are not already motivated to. Scientists call this intrinsic motivation. Japanese philosophy asks people to find their ikigai intrinsically, in our previous actions. If you look back, you’ll remember as a child you had a natural inclination towards something. When adulthood comes, our natural orientation is influenced by social-economic factors like; what others are doing, what our parents believe we should be doing, what type of income we believe we need for certain standards of living. Four questions to rediscover our natural orientation. Immersed in the blurr of our everyday, detecting our strengths is not always easy. There are four questions which can help us find our path. If you write them down somewhere where you come across them regularly, you can use them as a compass bringing you closer to your purpose. Whenever something new surfaces, just take the moment to jot it down. Let’s begin. What is my element? Do you see yourself more as an extrovert or an introvert? Do you find yourself enjoying activities in groups or on your own? Sometimes it’s a mix, but be sure to write down the type of company you enjoy in various situations. With what activities do I experience flow? When does your time fly. What it something you could spend hours actively doing. This is an activity in which you will feel fully engaged, and won’t be thinking about anything else while doing. What do you find easy to do? Is there anything which you personally find easy that others seem to struggle with? Some people find organizing documents in a clear manner easy, others are great at understanding different viewpoints. What did you like doing when you were a kid? This question helps establish the basis of your ikigai. Are your strengths intrapersonal, interpersonal, logical, physical (kinesthetic), linguistic, aural, or maybe visual (spatial)? Ikigai in the modern life. Ikigai is the union point of four fundamental components of life: passion, vocation, profession and mission. In other words, where; what you love meets what you are good at, meets what you can be valued and paid for meets that which the world needs. Ikigai is only complete if the goal implies a service to the community. We feel more satisfied giving gifts than receiving. The next step, once you’ve identified these components, would be to start following your compass. Start working on your questions, and see how your answers fit in the Ikigai components. Cyberclick practices and life fulfilment. The pursuit of life fulfilment has been the ultimate goal of human beings since the beginning of time. We seek practices that bring us fulfillment, and this is just as necessary throughout our time within Cyberclick as it is in our personal lives. Japanese philosophy shows that 'ikigai' is not a practice to exclusively revel in outside of work, but one that should be inherent in all aspects of our lives. We spend a great deal of our time in our office and it can be hard to feel fulfilled if every morning we have to make a superhuman effort to get out of bed and make our way to a place where we do not feel valued for the way we embark our personal journey with the world. People should always be a priority in any organisation and most importantly the actualisation of their personal goals. Though this may sound naïve, the truth is that if you take care of the well-being of your employees, your results will soar. From a financial viewpoint, investing in your team's intrinsic motivation, your team's ikigai, increases your ROI. Recently, David Tomás published his first book, named “The happiest company in the world”, where he reflects on the organizational culture that we have developed over the years here at Cyberclick and the practical keys which have allowed us to win the award for Best Workplaces in Spain two years consecutively. Life fulfillment and Great Place to Work. Trust between coworkers and leaders. Pride in the role you preform. Trust is the first place you have to start; it’s the glue to any company. If you want to improve and grow. Trust is dependent on the relationship between the employee and the company. It’s in the hands of the workplace and team to make improvements. The results of obtaining trust in your workplace are innumerable; employees are more comfortable in their environment, can rely on one another for support, feel valued and are much more confident to voice their opinions and ideas. Pride and camaraderie are more difficult to define and obtain. These two values are different in that they depend on each individual person, their personalities and needs. They are reliant on the relationship between the employee and his or her job (pride) and the relationship between the employee and his or her coworkers (camaraderie). The needs each person has to be proud of their job are personal and unique and it’s crucial to ensure everyone is in a role that satisfies their goals. The quality of relationships with coworkers depends on the personalities and different preferences each person has as well as the ability of the team to match them seamlessly. Pride and camaraderie can be related back to the concept by ikigai when you think about the notion of 'to live and let live'. Appreciating others for their personal reason for being whilst valuing yourself for yours, allows a harmonious work environment composed of successful individuals. In order to be a company composed of fulfilled individuals, you have to first be a great place to work that focuses on the three factors listed previously; trust, pride, and camaraderie. The way to become a fulfilling place to work is quite similar to the way you become a fulfilled individual. You can’t focus on the fulfillment itself, but you have to dedicate yourself to your passions and a balanced lifestyle. It is a process specific to the individual as well as the workplace. This process needs certain tools such as the time and space to discuss the 4 questions of ikigai, trust, support and clear communication. Saying that you have the most fulfilling workplace in the world is the same as saying you are the most fulfilled person in the world. This could be true, but it’s specific and unique to you only, if another person were in your shoes living your life they wouldn’t feel the exact same way as you. To be the most fulfilling workplace in the world is reliant on and exclusive to your specific team of individuals, their personal reasons for being, processes to get there and aligning them all. Each employee needs to be in a role with daily tasks that are aligned with their own personal and professional purpose, which results in the byproduct of life fulfilment. By aligning individual Ikigais with the workplace goals, you are following the process to create a a fulfilling organisation. The goal of becoming the most fulfilling workplace in the world is one well worth pursuing. If more organisations would stop and ask how they could collectively become a fulfilling one, the number of people suffering from anxiety and stress would decrease while the level of collective fulfilment would inevitably increase goal achievement. Get to know Cyberclick through Estela Viñarás. To give a 360º view of how current employees view Cyberclick from within, we have recovered a recent interview with our partner Estela Viñarás(Client Relations). Get to know Cyberclick through this extract from the interview on digital medium PRNoticias. In what services does the agency focus? In Cyberclick we have specialized in providing services in the digital field, through strategies aimed at attracting traffic results. Each of the companies in the group have developed their full expertise in specific channels, some examples are SEM, Inbound Marketing, Email Marketing, Social and Content Ads. What is your differential value and positioning now against other sector agencies engaged in similar aspects of marketing? People and technology, but especially people. Any professional advanced training sector could create a good campaign and manage it, but there's a big difference between an excellent profile and the mean. That excellence, for us, is at the maximum commitment to results and the ability to offer customers a unique collaboration experience. To achieve this it is essential to measure the welfare and happiness of all team members. We are a happy team and this is reflected in the way we work and interact in day to day. Could you tell us one strength and one weakness where we should improve in Spanish marketing? Marketing companies are innovative, enthusiastic teams with high performance. As for a weakness, we continue to see a lack of analytical insight, the ability to identify and track appropriate KPI's. Having a good model of attribution is fundamental and here there is still a long way to go. An aspect or campaign that you may boast at the company. Achieving the objectives (and overcome if we can) is what we are most proud of any action we do, and of course see that the customer is satisfied in every way and feel us as partners and allies in achieving the results that the company requires. An example of a multichannel campaign in which the good work of the team is clear is Renfe-SNCF Cooperation, a company for which we drive actions in social profiles, Capture Email Marketing, Social Ads and Content Ads. Specifically parts (html's) worked for Email Marketing have achieved very high rates of conversion, and this has been highly profitable for the project on the part of growing database of clients and visits to the site and blog. Example from the competition that you admire. Although not our direct competition, something that caught my attention was the development of the App "Subaru Ski" by Hello Media Group, which has won the award for Best Mobile Marketing Campaign Digital Awards in 2015. This application helps smartphones to know what weather is expected, the quality of the snow and skiing conditions from your favorite ski station. On the other hand, what would you like to improve in the New Year? We are focusing on a solution that manages advertising on Twitter (Twitter Ads) programmatically based on decisions in real time and artificial intelligence algorithms. The aim is to maximize the return on investment of Twitter advertisers and impact the most relevant users. We are also deepening the Native Advertising (Content Ads), a channel that is gaining more and more strength in the online environment and which is based on creating quality content for users, avoiding the classic ads. Name us some clients that are in your portfolio now. Today we work with Securitas Direct, Iberia, Jazztel, Renfe-SNCF Cooperation, NH Hotels, DKV, Switzerland Tourism. What professional profiles are sought in this agency? The profiles sought are those that typically traditional companies look for. We create multidisciplinary teams composed of, among others, mathematicians, engineers, advertisers, journalists and professionals from all over the world in the company. In everyone there should be two defined and personal values present: the ability to ask questions constantly and admire the other members of the team would be two of the most important aspects. What have you put the most effort into this year. Just because our differential value is people, one of the great challenges and difficulties we have is finding the right people. This year we have chosen to grow, which is why we have invested great effort in carrying out all selection processes. What do you consider to have been the biggest achievement this year for your company? The recognition of our clients: their results have improved and we want to continue working with more actions on a larger scale. Some of them have even recommended us to other companies and this made us very proud and energizes us to keep growing and improving. Finally, a desire for the sector of marketing and advertising for the new term. There is a significant growth in digital commitment, according to the latest data from the IAB Europe in 2014 European countries spent on online advertising 30.7 billion - up 11.8% over the previous year. Clearly, users have migrated and businesses are still halfway there. The field of marketing and advertising needs to bet strongly on the environment where most consumers are today.